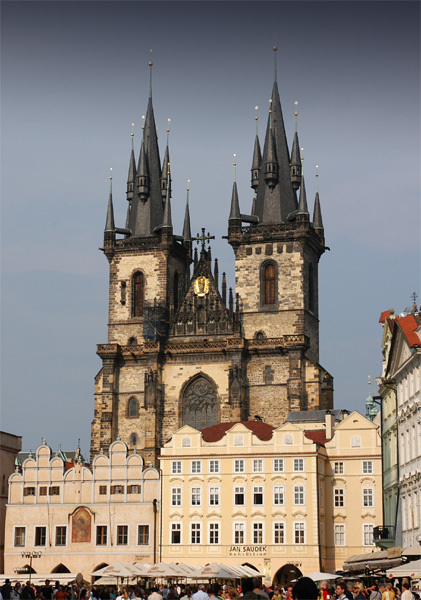 The real name for Tyn Cathedral is The Church of Our Lady before Tyn (Kostel Matky Boží před Týnem) and it is great Gothic dominant of Prague Old Town Square. The history of this former Romanesque Church comes back to the 12th century. The main Gothic rebuilding of Tyn Church is from time between 14th and 15th century. The Tyn Church was hit by fire in 1679 and the gothic dome of the main nave has been reconstructed in the early Baroque style. Parts of the original Gothic structure have been kept. If you think that the Tyn Church Twin Towers are identical you are wrong. One of them is in fact a bit more solid and it is said that it represents the man – the stronger side of family. Posted: Praha, Jun 3, 14:12 by Czech-man. Are you planning a trip to Prague and looking for some interesting Prague pictures? Or would you just like a reminder of the places or sights of this beautiful city in the heart of Europe? Let me inspire you with more than 70 pictures of Prague main tourist attractions as well as some hidden and forgotten places. All photographs are divided by location as well as by theme for easier orientation. I know, I should speak less and let the photographs speak for themselves. So, have a nice time with my pictures, I am on the way to take another one.